The BJP termed the Kolkata rally as a demonstration of a divided Opposition, which lacked a common agenda. 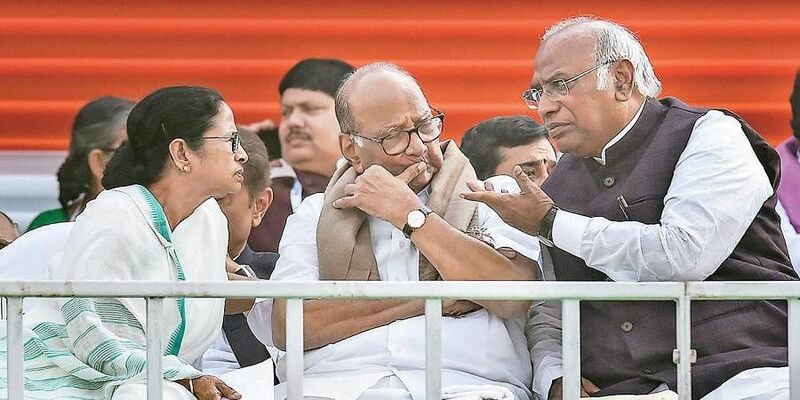 NEW DELHI: The BJP took a potshot at the united opposition rally, organised by TMC supremo Mamata Banerjee, and called it “a rally of self-interest and of conflicting ideologies”, and exuded the confidence of forming the next government. They also asked, “who is their PM face”. The BJP claimed that the Opposition outfits’ only agenda is to remove Prime Minister Narendra Modi from office. “They have no future road-map for the country,” said Union Minister Ravi Shankar Prasad. He stressed that the leaders, who are part of the alliance, also harbour the ambition of becoming the prime minister. BJP spokesperson Rajiv Pratap Rudy too wondered “who is the leader of this gathbandhan (alliance)”. “These leaders have been fighting each other... They have come together with selfish motives,” said Rudy, while illustrating his claims with the SP-BSP alliance keeping out the Congress in UP. Yet, their leaders shared the dais in Kolkata. People are watching the political drama in Karnataka, where the MLAs are being meted out the “third category of citizen” treatment. “Those who were present at the rally haven’t made their agenda clear for the country. This is a gathering of people with selfish interest and desire to become the PM,” claimed Rudy. The BJP leader claimed that PM Modi has delivered on all fronts and people are supporting him now. Union Minister Ram Vilas Paswan attacked the Opposition jamboree in Kolkata and said that leaders of outfits with one MP in the Lok Sabha are nursing the ambition to become the PM.